Participatory discussion with two pastoralist communities in South Omo and key informant interviews with project staff and government officials provided an insight into the effectiveness of the Market-Based Approaches to Resilience (MAR) project in Ethiopia implemented under the Department for International Development (DFID) Building Resilience and Adaptation to Climate Extremes (BRACED) programme. Though all stakeholders thought that BRACED project interventions had partially mitigated the impact of the 2015/16 drought and helped with recovery, communities and project staff scored the effectiveness of interventions differently. Community members particularly valued Participatory Natural Resource Management (PNRM) when the drought struck while project staff also accounted for the huge amount of work required to secure these benefits and saw village savings and loan schemes (VSLAs) as the most efficient way to build resilience. Community participants ranked their VSLAs second to PNRM in terms of drought resilience but identified clear livelihood benefits. Weather information was also valued by users, but it was less useful for more remote communities. 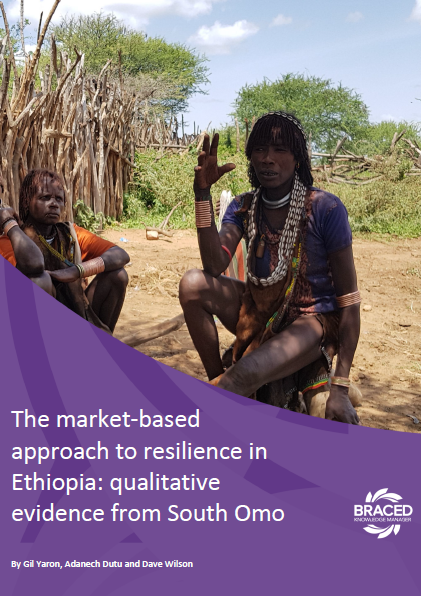 Our findings also suggest a number of changes that are likely to make the thresholds used to calculate the resilience index adopted by the project more useful.